Norman took a little license with the interior. Most obvious is the wonderful bare door panels. He figured, if you can't see them in the box art, they are fair game for improvement. He studied a highly-detailed text on building authentic Model A Hot Rods to learn just where all the holes belong. The dash features his Replicas and Miniatures Company of Maryland (R&MCo) five-hole gauge panel with acetate gauge faces. The steering wheel was painted black and "cord wrapped" with white sewing thread. 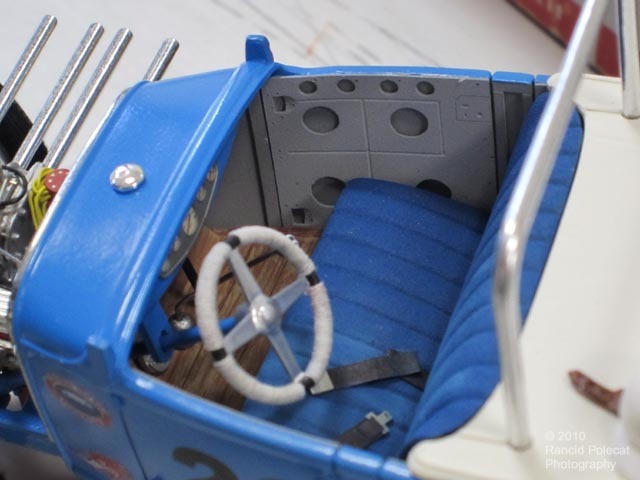 The roll bar and tonneau cover are resin reproductions of pieces that came in the original flat box kit, but which have disappeared from subsequent reissues. Both are in his R&MCo product line. Other resin R&MCo products used for the interior include the foot-shaped accelerator pedal, and racing helmet. The shifter is a bent ball-headed straight pin with a hand painted "8" on it.